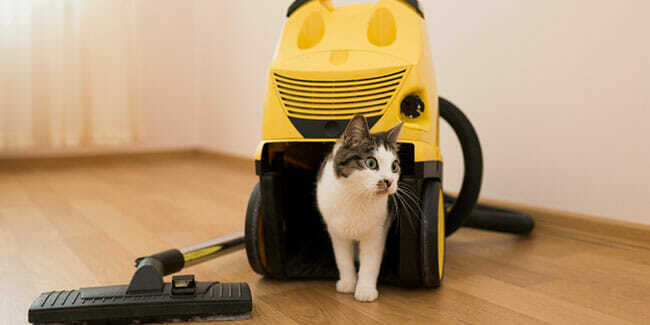 Pet owners know that a good pet vacuum that is actually able to remove pet hair is worth paying extra. Unfortunately, so do vacuum manufacturers and retailers. As we live in a world of false advertising, it is quite common for a regular vacuum cleaner to be advertised as a pet vacuum and sold at a higher price in spite of the absence of pet-related features. To help you avoid falling prey to marketing tricks and consequently wasting hard-earned cash, we will introduce you to the most important qualities that differentiate a pet vacuum cleaner from a regular vacuum. Removing pet hair requires great suction power. The best pet vacuums are equipped with powerful motors and use advanced technologies to prevent suction loss. Generally, you want a vacuum with a power rating of at least 200 air watts (AW). If the manufacturer does not provide suction power information expressed in AW but instead provides information on amperage, 8-12 Amps is what you are looking for (12 Amps is the maximum allowed). However, amperage is not a 100% reliable measure of suction power, so you need to check if any technologies are used to ensure powerful suction. Uprights generally produce the best results in terms of pet hair removal. While not every upright is a pet vacuum, most of the top-rated pet vacuums are uprights. They usually boast greater suction power than other types of pet vacuums and their design allows for better airflow and hair pickup. Speaking of design, a pet vacuum needs to feature an intelligent design that prevents hair-related issues. If the suction tube is at the center of the head, it is less likely that hair will get stuck in the brush. If the vacuum uses cyclonic technology, it employs centrifugal force that spins the hair and dirt directly into the dirt cup, minimizing airflow obstructions. If the air path from the floor to the dirt cup is direct instead of maze-like, suction is more powerful, which results in better hair pickup. These are details an average consumer may not pay attention to without previous knowledge, but they greatly affect the vacuum’s efficiency in pet hair removal and they make pet vacuums superior to regular models. Filtration is of crucial importance in pet vacuums. A good filter catches pet dander, captures allergens, and prevents even the tiniest of particles from escaping the vacuum. As domestic animal allergens are among the top causes of allergy, the value of an efficient filter cannot be overemphasized. That is why pet vacuums come with high-efficiency allergen filters, preferably HEPA, and often employ multi-level filtration. Furthermore, some of the best pet vacuum cleaners like Bissell Powerlifter are equipped with advanced filters that even eliminate pet odors and freshen the air as you vacuum. To lift and remove deep-embedded pet hair and dirt from carpets, a vacuum needs to have a motorized rotating brush roll particularly designed for that purpose. This is one of the key distinctive features of pet vacuums and one of the easiest ways to tell them apart from regular vacuum cleaners. Pet vacuum cleaners do not only have powerful brushes that loosen and eliminate pet hair from deep within the carpet but also feature automatic or multi-level manual height adjustment that allows for easy hair removal on both high-pile and low-pile carpets. While a specialized brush roll is necessary to efficiently eliminate pet hair, it is also important for the vacuum to have a brush roll on/off switch, so it can be safely used on bare floors. To make sure that the vacuum you have selected is indeed a pet vacuum cleaner, check its accessory pack. If the vacuum comes with attachments that are particularly designed to handle pet hair, you have made the right choice. These attachments often come in the form of crevice tools, dust brush tools, turbo nozzles, and other handy accessories that are designed to eliminate pet hair from upholstery, stairs, and hard-to-reach places where pet hair tends to accumulate. In other words, a vacuum’s accessory pack tells you whether the vacuum in question is designed to eliminate pet hair from all surfaces, including narrow spaces, furniture, and even clothes. If these accessories are missing, the vacuum does not meet the basic pet vacuum criteria. Pet vacuum cleaners are characterized by a unique design, specialized tools, and advanced technologies whose primary purpose is to facilitate pet hair removal. From strong, cyclonic suction and direct air path to powerful brush rolls, efficient filtration systems, and pet-related accessories, all aspects and components of a pet vacuum cleaner are specially designed for use in households with pets. Therefore, when determining whether your vacuum of choice is genuinely a pet vacuum, you should not trust the labeling blindly, but check whether it possesses all the characteristics described above before you make a purchase.